DO you remember this film? It was a small movie released in 1993 and starred only two famous actors Joe Mantegna and Ben Kingsley. But it sure packed a wallop. Based on a real life story, the film was about child chess prodigy Joshua Waitzkin and how his coach, played by Kingsley, tried to teach him the aggressive moves of grandmaster Bobby Fischer. It was a very engaging film, especially if you're watching the chess games, and despite Kingsley's prodding, Joshua remains a very polite and respectable chess player. This was unlike Fischer of course, whose games had always been marred by his tantrums and demands. I've always found chess a very interesting game. I used to play it as a child but quickly outgrew it. I couldn't take all that thinking! It's true, it is a game for brilliant minds, and sad to say, I'm not one of them...haha! On the other hand, it's good I stopped playing the game. Baka mabuang pa ako like Bobby Fischer, grabeh! You know what they say, there's a very thin line between genius and insanity. The entire world always thought Fischer was a recluse, but in fact, he had been travelling regularly to the Philippines, because his best friend was Filipino grandmaster Eugene Torre. I remember that when the terrorists attacked New York on Sept. 11, 2001, not too long after, Fischer went on radio using a Baguio broadcasting station to air his grievances against the United States. We had tried to get a copy of the transcript of that broadcast but as I recall, we were unsuccessful in doing so. The media generally dubbed Fischer as a weirdo, and although he was a Jew, he was always pilloring the religious/ethnic group, making all sorts of inappropriate anti-Semitic comments. Anyway, as it turns out, Fischer fathered a child while he was staying in Baguio City, according to the Phil. Daily Inquirer. He even played tennis at the Baguio Country Club. His girlfriend supposedly now lives in Davao City but has maintained close ties with the chess master. Fischer died on Jan. 17 from liver failure, in Iceland. The New York Times also came out with a rather unkind analysis of Fischer, but hey, even in death, he really could rouse up all these emotions toward him. That's how much his genius (or yes, craziness) has impacted on the world. 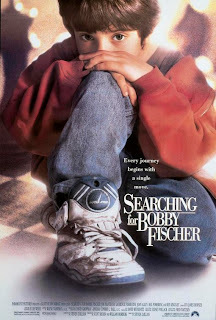 If you can still find a DVD copy of Searching for Bobby Fischer, buy it. It's a really entertaining film. This is one of the best true-to-life movies ever made.